Read the post headline again and let that sink in. You can fly from Newark, NJ (New York) to Stockholm, Sweden for $99 one-way. Better yet, the new baggage policy should save you even more money. How are $99 one-way Europe flights possible? Wow Airlines is an Iceland-based budget airline that offers rock-bottom pricing but charges for many of the little things along the way. The good news is that a little planning can help you avoid many of the fees. I flew Wow Airlines a few months back and had an AWESOME experience, I blogged about it on my blog in this blog post. First let’s look at some of the cities you can fly to and from for these insane prices. ALL flights connect in Reykjavik, Iceland on the way Europe. Our layover in REK was very pleasant. Extremely clean and modern airport, you can get to any corner of the airport quickly. As of writing, the best deals to Europe from the East Coast are to; Stockholm, Berlin, Paris, Copenhagen, and Amsterdam. If you are flexible on your dates and don’t mind going to Europe in the winter, you can score a one-way for somewhere in the $99-$180 range on select days (from the East Coast). Don’t forget to wear your heaviest jacket when you board! What are the extra baggage fees? The most difficult fee to avoid will be baggage fees when flying on a low-cost-carrier, and Wow Air is no different. Fortunately, Wow Airlines has just increased their free baggage allowance in two key ways. Prior to today, the weight allowance for your free carry-on was only 11lbs and limited to a single bag. When we flew Wow Airlines in May they did not check the weight of our hand baggage while boarding in Paris or Reykjavik. Not sure if that is standard practice, but that was our experience. 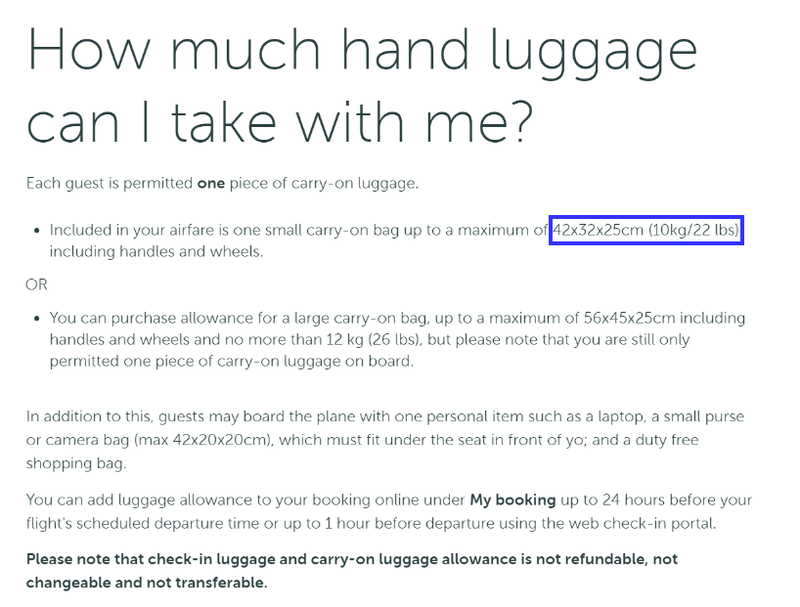 Starting today, you are allowed to bring a carry-on bag measuring 16″ x 12″ x 10″ and weighing up to 22lbs. In addition to this free carry-on you are also permitted to bring a free personal item measuring 16″ x 8″ x 8″. There is no weight limit on the personal item, which must be placed under your seat. The key would be to place your heavy items like a laptop and camera in your personal item (backpack or purse), then place your bulky items like shoes and pants in your carry-on. This new bag policy will make it easier to avoid paying extra fees for bags on Wow Air! Alyssa and I like to travel light so this new baggage policy should be adequate for 4-5 nights in Europe unless you prefer to bring the kitchen sink. Each passenger can also board with a duty-free shopping bag for goodies they purchase in the terminal. So wait to buy your souvenirs until after security. If you are a kitchen-sink traveler, you can pay for a heavier carry-on bag (remember, it is free up to 22lbs), which allows you a bag up to 22″ x 17″ x 8″ and increases the weight limit to 26lbs. If you are traveling from the East Coast to Europe, that larger carry-on bag allowance will run you $48. West Coast flyers bound for Europe will have to pay $58 for the same thing. Also, these fees increase the longer you wait so if you know you need the extra allowance, pay for it at the time of booking. If you have a really heavy bag and need to check it (also known as ‘hold luggage’), you will pay $68 from the East Coast and $77 from the West Coast, if you are heading to Europe. If you are just heading to Iceland, the fees are $49 and $68 respectively. A checked bag can weigh up to 44 lbs and cannot exceed a combined 62″. You will add your length, width, and height to get your total combined dimensions. IE: 24″ x 16″ x 14″ = 54″ combined, so you’d be in the clear (if you are under 44lbs). Do keep in mind that you must pay if you want to reserve a seat. When we flew we opted to gamble and not reserve seats, we ended up side-by-side with a row to ourselves! Also, you must fork-over cash for food and drinks on-board. Coffee and soft-drinks are around $3 and snacks range from $5-$10. (plan ahead for your munchies) Each row does have a standard AC wall outlet so be sure to keep your laptop charger within reach for that long flight. If the flights are too pricey coming home on Wow Airlines, check out Norwegian Airlines. (we are flying them in two weeks, review to follow) I found a $144 nonstop one-way from Stockholm to Los Angeles around Thanksgiving! Baggage allowance is similar on Norwegian Air, however Wow Airlines does not post a weight limit on your personal item which can help greatly. Oh yea, Norwegian flies the new Boeing 787 Dreamliner. Pro tip: Booking on norwegian.no will occasionally yield a lower price when the currency conversion takes place. Be sure you are using a credit card with no foreign transaction fee *inserts cliche credit card referral link here*. Your currency should show “NOK” and will sometimes be cheaper than paying in USD. You can play with a currency calculator to see if it’s in your favor to book in NOK rather than USD.